NFL Media insider Ian Rapoport has reported that Kansas City Chiefs running back Spencer Ware will miss the entire 2017 season. After multiple tests, Ware was diagnosed with a torn PCL and LCL, and faces a long and intense rehab if he’s to return in 2018. Ware ended the 2016 season ranked 19th of 61 qualifying running backs with a PFF overall grade of 77.2. He handled 65.4 percent of the Chief’s rushing attempts, and averaged 2.81 yards after contact per carry, which ranked 16th of 53 running backs with at least 80 rushing attempts. A dynamic weapon out of the backfield, Ware was also a key feature in the passing game. He saw 42 targets in 2016, and averaged 1.76 yards per route run, the league’s fifth-highest mark. 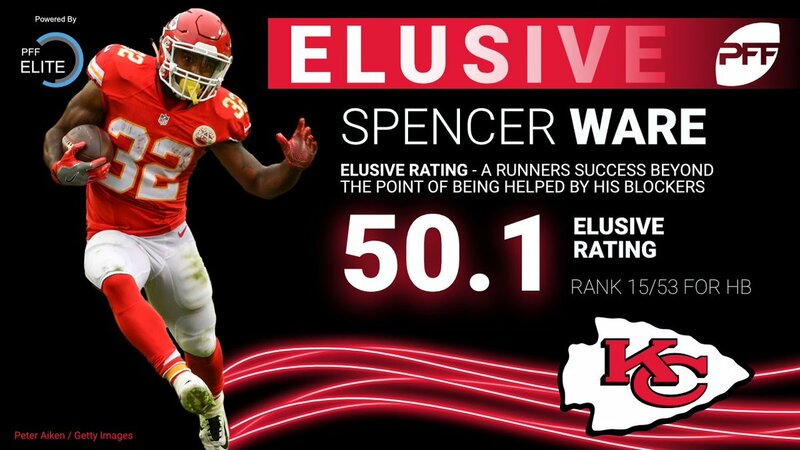 On 247 rushing and receiving attempts, Ware forced 44 missed tackles, and ended the campaign with an elusive rating (the PFF metric that measures a runner’s success beyond the point of being helped by his blockers) of 50.1, which ranked 15th of 53 qualifying running backs. In Ware’s absence, the Chiefs will turn to rookie Kareem Hunt to assume the starting role. In his senior season at Toledo, Hunt earned an ‘elite’ PFF grade of 95.1, and ended the year with an elusive rating of 112.1, the third highest rating among draft eligible running backs.